SP Scientific announces the LyoConstellation™ S10, S20 and S30 as the first in a new series of advanced freeze dryers. All are configured-to-order for faster equipment delivery and efficient freeze-drying cycle development and small-scale aseptic production, such as production of stability batches or early phase clinical trial batches. Offering a capacity of 9.8 ft2 (1 m2) and precise shelf temperature control from -55 C to +65 C, the LyoConstellation S10 is designed, even when fully loaded, to hold 100 mTorr vacuum and shelf temperatures of over +40 C enabling unmatched sublimation rates with high moisture applications with no evidence of choked flow. Isolator and cleanroom integratable, the LyoConstellation is capable of clean-in-place (CIP) and steam-in-place (SIP) for aseptic manufacturing. The LyoConstellation series including the S10, S20 and S30 offering shelf capacities from 9.8 ft2 (1 m2) to 33 ft2 (3 m2) are all powerfully equipped as standard to provide very high capacity, broaden equipment capability, and expand design space. Configurable with the latest technologies including SMART cycle optimization technology, ControLyo® Ice Nucleation Technology and LyoFlux® TDLAS (Tunable Diode Laser Absorption Spectroscopy) for vapor mass flow measurement and inference of critical data such as batch product temperature and batch Kv (vial heat transfer coefficient), the LyoConstellation is able to deliver an unmatched array of process analytical data. These technology options together with the LyoS software platform, for working in compliance with 21 CFR Part 11, are common to the full range of SP Scientific freeze dryers enabling the same technologies and equipment to be used for both R&D and production. For further information on the LyoConstellation freeze dryer series, please visit https://www.spscientific.com/LyoConstellationFreezeDryer/ or contact SP Scientific on +1-845-255-5000 (+44-1473-240000 in Europe). Line of Sight is a breakthrough concept from SP Scientific comprising a suite of freeze-drying equipment with scalable lyophilization technologies and process analytical technology (PAT) tools. Line of Sight has been designed for pharmaceutical developers and manufacturers to assist them achieve drug commercialization objectives. 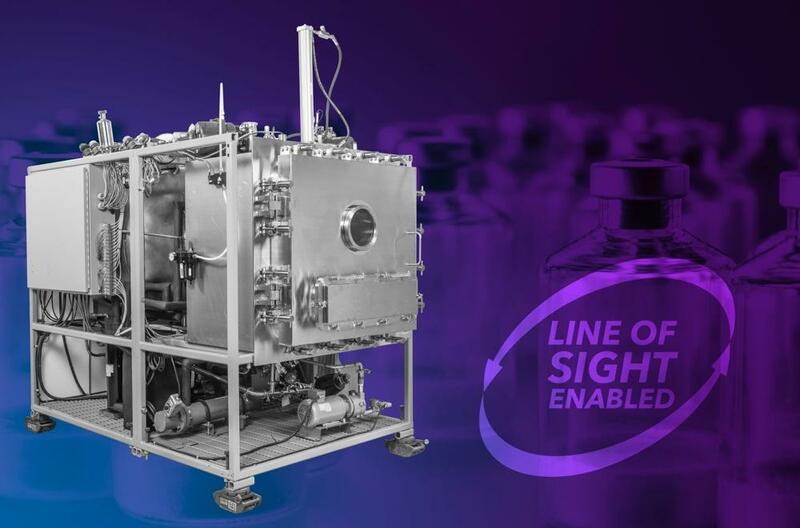 Line of Sight technologies have been developed to provide the tools for a more successful scale-up of a lyophilization process from formulation through to full commercial production. This ensures superior product quality and uniformity and creates a data rich environment across all sizes of freeze-drying systems. The next step forward in lyophilization - the science of freeze-drying - is being developed for pharmaceutical applications with enhanced technological capabilities, improved process and product understanding, and by implementing Line of Sight enabled freeze-drying equipment. SP Scientific is a leading manufacturer of freeze dryers / lyophilizers, aseptic fill-finish equipment, temperature control / thermal management equipment, centrifugal evaporators and concentrators, glassware washers, and controlled environmental rooms and chambers. The company sells its products under well-known brands including VirTis, Hull, PennTech, FTS Systems, Genevac and Hotpack. SP Scientific has ISO 9001:2015 registered production facilities in the USA and Europe. Further Info: Billie Gallo (tel +1-845-255-5000 / email billie.gallo@spscientific.com.